Still playing Guild Wars 2, though I have long since reached the bored now stage. I have no further interest in levelling other characters, however, I still have world and storyline completion to deal with (and finding new outfits), which is what keeps me casually playing. Since these are things I can do alone and because I am not paying a monthly fee, I don’t feel the obligation and the subsequent bitterness. I can hop on and complete a map at my leisure or do a story mission here and there and occasionally, the guild will get together for an adventure or two. We’ve had a few more people join in the past month and I think they are getting the hang of the casual environment, which works perfectly for grown ups like us with outside obligations. Overall, I really can’t deny the MMO of the Year trophies Guild Wars 2 is receiving, because it works for me on so many levels. Not that the game isn’t without its flaws, which is to be expected. There have been many improvements over the months since its launch, and I’m sure there are still more to come. One of the most notable issues I have is not a technical one: I am disappointed in the poor story content. The lacking story becomes more evident as I step into my new project: joining the "250 Years Club" (a.k.a. playing Guild Wars). When GW2 launched, someone complained about the various items in the game that referenced GW, which he felt alienated people like me who had not played the first game. He felt it forced players who cared about the lore to interrupt their gaming experience to learn more. Frankly, I had no issue with this. GW2 is obviously a sequel so I expected the lore to exist and, since I hadn’t played GW, it was absolutely my responsibility to learn more. I did and do a lot of wiki-ing and have even read one of the books, with intent to read the others eventually, but ultimately, that’s not good enough. So, now I am playing Guild Wars, dragging Digitaltempest and Deacon with me to (re)experience the goodness. I’m barely level 10, playing a ranger in Elona through the Nightfall expansion and can already see the difference. 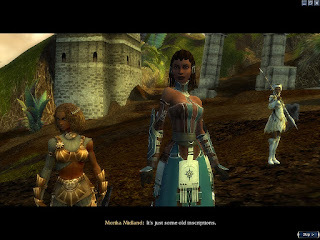 Certainly GW2 has improved on a lot of the game mechanics, but the meat of the game – the story – remains with the original, and I can’t wait to learn more about Kormir’s ascension, experience the Foefire, meet the Norn for the first time… And apparently, through a series of story additions that are still going on now, GW is still quite actively working to tie the two games together through the lore. Nightfall and Factions are impressive from the moment they start, since they bring in cultures beyond the typical European-based fantasy and I praise ArenaNet for being so inclusive. 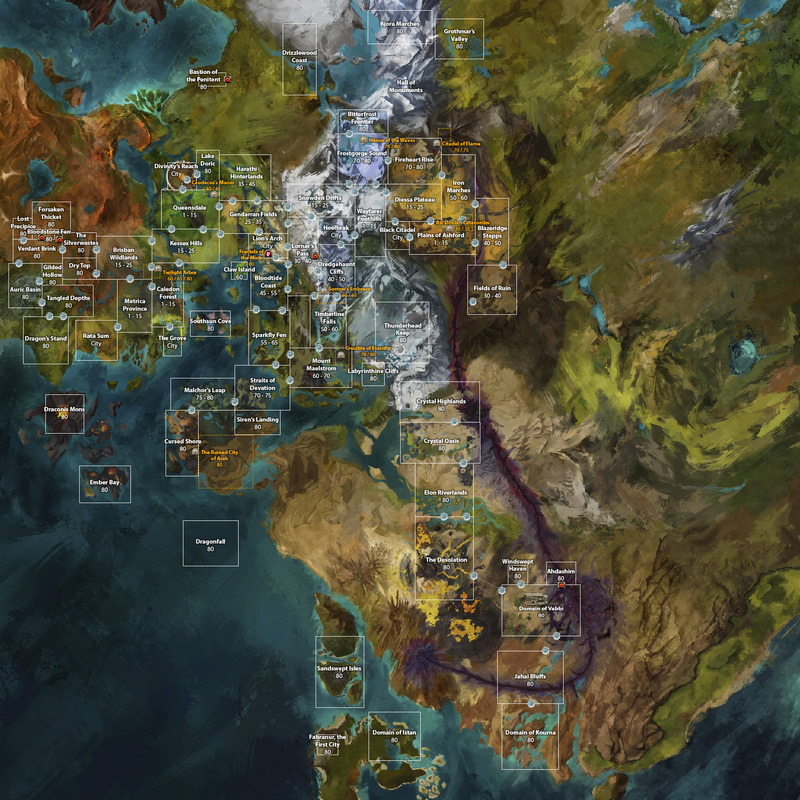 There are rumours in GW2 that the lands of Cantha and Elona still exist, and I can see by the GW2 world map that there are still huge areas that we cannot yet access. I can only assume they will be filled in future expansions, but I sincerely hope the expansions will involve stories, characters and character creation options as meaningful and interesting as its predecessor. 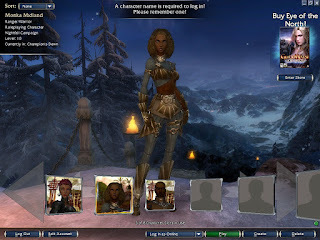 Guild Wars, through its expansions, also sports one of the best things any MMO could ever include: companion NPCs, called "Heroes," in the game. Hell, GW even allows you to use your own alternate characters as heroes. I’m resisting the temptation to buy the Mercenary Pack, but if GW2 ever offers it… all my money, ArenaNet! I understand that ANet opted for a more community environment in GW2, where things can be achieved by working with other players – this is an MMO after all – but many of us like the convenience of working solo and companions can make all the difference. I had no idea, though, that GW offered so many options with its heroes and it makes me sad that the AI functionality present in GW is so very lacking in GW2. Not only are the GW2 companions that are present in story missions rather dull, they are also, quite often, useless.